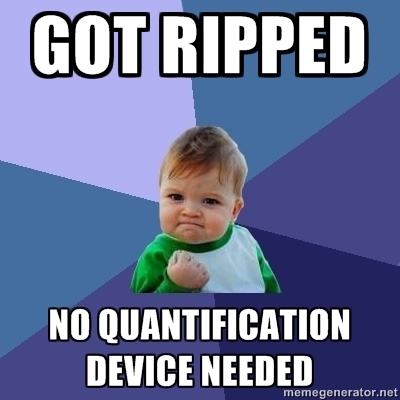 Home > Health	> QUANTIFY WHAAAAT? STOP XQ-SES! Start MOVING! QUANTIFY WHAAAAT? STOP XQ-SES! Start MOVING! 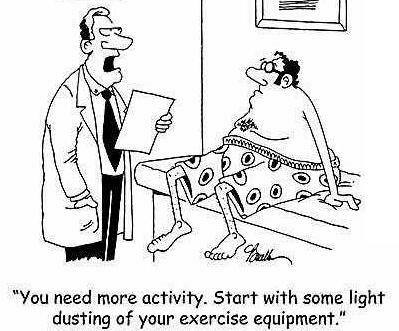 I always have been a health exercise oriented person and so has my family. I thank them for raising me up like these. Problem I see is most families are not raised like these and for this reason obesity has become an epidemic. Reasoning is that quantifying will help you measure yourself in order to get fit. Agree it can help in some cases but in your average “Joe” is not needed. The most important denominator in successful weight loss and health is MOTIVATION. GOOD LUCK! Everyone can do it you just need to be pushed in the right direction! I both agree and disagree. These gadgets aren’t necessary for weight loss, but they can be very motivational. I think they can also give people a good wake up call regarding how many calories they actually burned. I’ve seen the “I worked out so I deserve a muffin” scenario many times, and I’ve even fallen prey to it myself. If I go to the gym or go for a walk, then think, “Wow, I was so good. I can reward myself with a muffin” then go to Starbucks and get a nice “healthy” zucchini walnut muffin (it’s healthy because it’s got zucchini and walnuts right?). Well, then maybe I burned 300 calories in my workout, but I just effectively erased that and then some with a 490 calorie muffin. I’m going on my 3rd year of maintaining a 68 lb weight loss (BMI of 23, thank you very much! ), and I do use a heart rate monitor. I probably could have done it without, but it’s very motivating to see those numbers add up. I might work out and have the HRM read 350 calories, and I will say, “Okay, I can do more” so I go for 400 calories. The HRM doesn’t do the work for me (it’s not magical), but it does give me an idea of how effective my workouts are and an idea of how many more calories I really did earn. Oh, and it also led me to the realization that fun things can be just as good, or better, of a workout than traditional exercise. I can burn 600-700 calories playing 1.5 hours of racquetball, and it’s actually fun. If I didn’t have the HRM I might think that I wasn’t getting as good of a workout as, say, running on the boring treadmill, but I actually burn more calories playing racquetball (because I will play for way longer than I can stand to run`). Anyway, gadgets and devices can be fun and motivational. They aren’t magic, and they aren’t a necessity, but they aren’t all bad. P.S. P90X is pretty expensive. LOL! Do not get me wrong I love gadgets but what got me upset is so many coming out and targeting people. All of the apps out there as well as gadgets want to make money and I just got little upset when colleagues, friends, and patients asked me about different ones. Some with a price tag greater than 350 dlls. If people want to lose weight all they need is a scale and thats all I wanted to prove. the other thing is that not because you are constantly measuring your blood pressure, your sleep, the amount of breaths you took will make you feel better or lose weight. I agree with you that they can help you make activities more interesting. For example social exercise applications creating competition enviornment. Track you run, walk, cycle wit gps and compare yourself to others.